Taipei, Taiwan – September, 2012, PNY Technologies, global leader in memory and peripheral products, has released the next addition to their popular and diverse attaché series, the classy Mini Hook Attaché USB flash drive. The Mini Hook Attaché incorporates a unique hook and lock mechanism that ensures maximum security and portable storage and sharing of images, videos, documents and more. The smooth and polished steel metal frame makes it the perfect epitome of style and technology suited for the modern and tech savvy world. The slim yet sturdy design makes the drive shockproof and secure data. The cap less and futuristic design offers easy plug and play operation and fast transfer of data files and media. The integrated hook can be easily fastened onto a wallet, backpack, key chain or any other accessory. The Mini Hook Attaché USB drive works compatibly with all existing versions of Windows operating system and Mac OS 10.3 above. The storage capacities are available in 4GB, 8GB, 16GB and 32GB memory respectively. The Mini Hook Attaché delivers quality, performance and reliability backed with a warranty of 5 years. http://www.pny.com.tw/index.php?mode=product_detail&PID=117 for more information or to learn more about the entire line-up of PNY products. 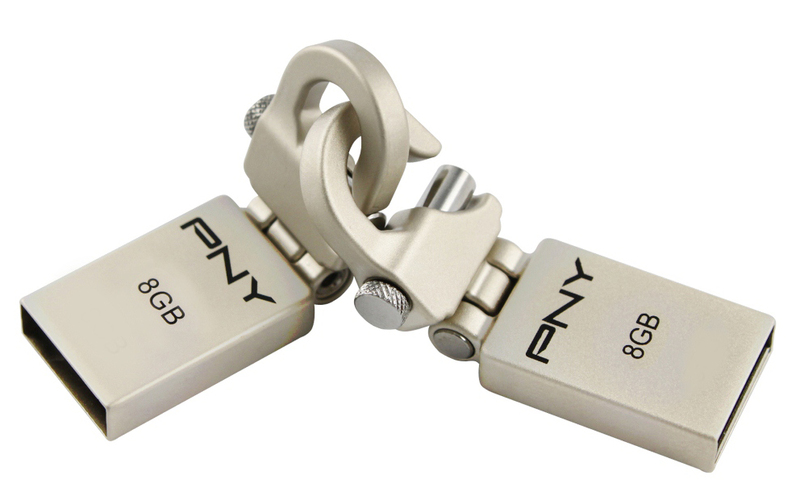 Established in 1985, PNY Technologies®, Inc. celebrates 30 years of business excellence as a leading manufacturer and supplier of flash memory cards, USB flash drives, solid state drives, memory upgrade modules. The company’s Photography-Videography, Mobility and Business solutions are widely available from major retail, e-tail and wholesale outlets internationally. Headquartered in Parsippany, NJ, PNY maintains facilities in North America, Europe, Asia and Latin America. PNY has good authorized partnership with HP since 2008. To date, PNY operates in 19 locations - with products sold in over 50 countries worldwide.